For essentially the same price as a pizza, burgers, and fries, you can have food that’s nutritious, tasty, different, unusual, or adventurous. You don’t have to resort to reservation-only, table service restaurants to experience great food. 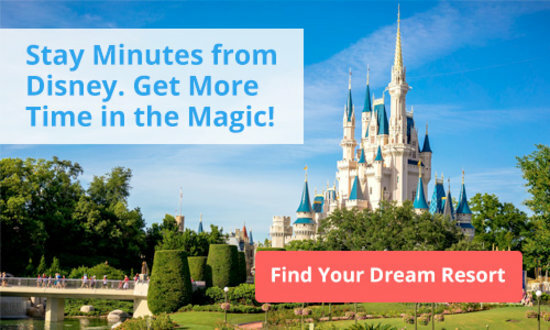 Disney World restaurants offering counter service, feature a wide variety of food and cuisine to suit all needs, beyond what you’d normally expect. Try to time your meals either before the main rush hour or at the tail end of the rush hour. Most counter service restaurants open at around 11 am or 11:30 am for lunch. 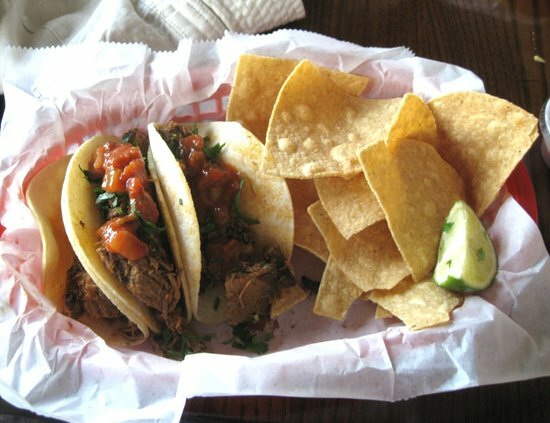 If you’re able to have lunch that early, then you’ll avoid the long lines and you’ll be able to find a table much easier. If not, have a small snack and grab lunch closer to 2 pm. This way you’ll avoid the lunch rush and enjoy shorter lines while everyone else dines. 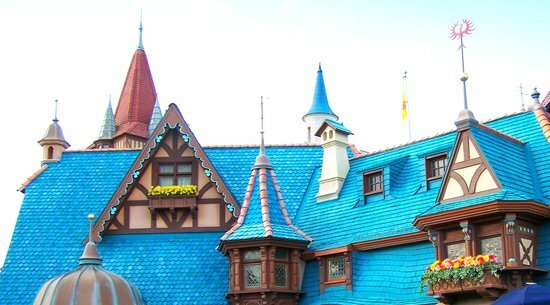 This is a rather charming Disney World restaurant. If you manage to snag a table near the large, glass windows, you’ll get to see boats of people about to embark on the Happiest Cruise on Earth – It’s a Small World. So smile and wave as they pass you by. The food here has a distinct Mediterranean theme, with three different flatbreads, a meatball sandwich, and a couple of salads. But I want to mention the often-overlooked sides. The garlic pesto bread knots are seriously addictive. And during Orlando’s brief winter, the tomato basil soup really hits the spot. Flame Tree is my favorite counter service in all of Disney’s Animal Kingdom, hands down. It has good food, and terrific waterfront seating. Unfortunately, if it rains, then it’s not so good, because the amount of covered area is limited. My favorite dish is the half-smoked chicken. It has a dry rub, the smoke flavor is distinctive, and the chicken is moist and succulent. Other favorites here are the Ribs and Chicken combo, the Ribs in St. Louis-Style BBQ, and the Smoked Chicken Sandwich. And of course, there are turkey legs. Most of the meals are served with a side accompaniment of baked beans and cornbread. 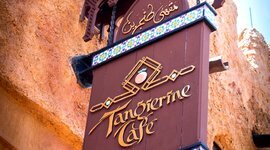 Tangierine Cafe is a safe, but delicious introduction to Mediterranean food. 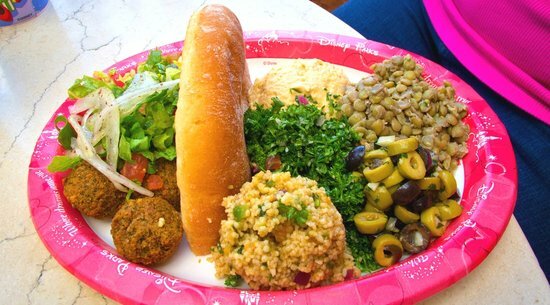 Located in the Morocco pavilion, it offers a fair variety of Mediterranean/Middle-Eastern fare from hummus to shwarma. 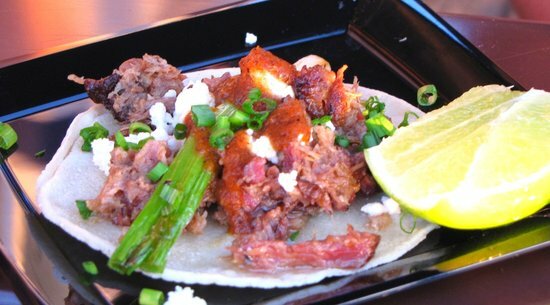 The platters come with lots of different dishes, while the wraps are smaller, but portable. Note however that the “lamb” items are actually gyro meat. They also have a larger and tastier selection of vegetarian items. In fact, the vegetarian platter is my favorite menu item here, even though I am not a vegetarian. It’s light, refreshing, and filling, the perfect lunch on a hot day. For a drink, check if they have mint iced tea. If you like BBQ chicken and ribs, this is your spot. It’s another counter service with outdoor seating, some covered. Guests favorites, based on what I often see fly out the counter, are the spareribs, the chicken, and pork sandwich. Even their salad is served with BBQ pork. And of course you can get your giant turkey legs fix. A Friendly Hint: Do the nearby Tower of Terror and Rock ‘n Roller Coaster attractions first before dining here. Otherwise, you or someone in your party might get to see it again on the way out. It’s a French bakery. Need I say more? Entrees ranges from sandwiches to salads with popular items, such as the Poulet au Pistou. It’s chicken with pesto, simple yet oh-so-satisfying. The Tartine Provencal is another favorite vegetarian item. 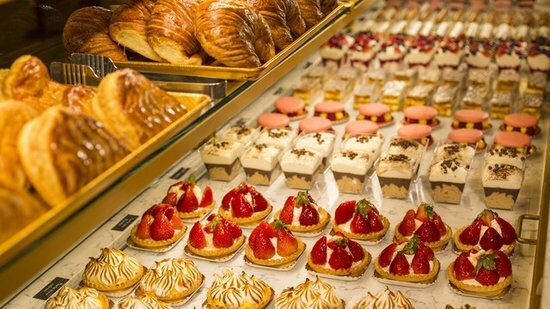 However, this might be the place where you skip the entree altogether, and go straight to the desserts and pastries, and no one will blame you. There’s a wide variety to choose from and you may have to make several trips here to truly satisfy your cravings. As expected, the bakery also offers beers, wines, and Champagne. The main draw here is that it’s designed to look like a boat, and located near the center of everything, on Echo lake. This Disney World restaurant serves two different versions of Macaroni and Cheese, one with BBQ pulled pork, while the other comes with Buffalo chicken. You may also get your giant turkey leg fix. For the adults, there’s a selection of beers, and frozen lemonade spiked with whiskey, rum, or vodka. This Norwegian bakery also serves sandwiches. The smoked salmon and egg sandwich is quite delicious and light, great as you get ready to continue walking around World Showcase. But the true winners here are the baked goods. The School Bread and the Troll Horn are delectable. 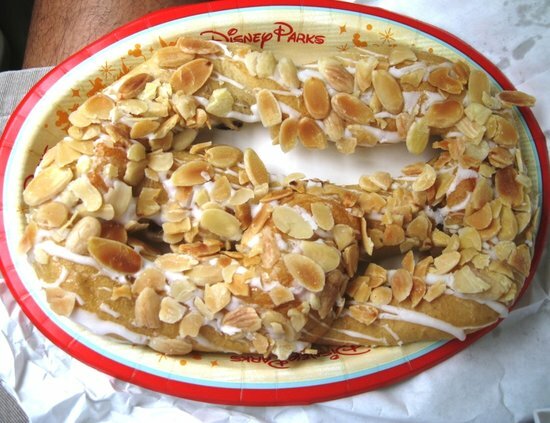 But don’t miss the Kringla, a sweet pretzel drizzled with sugar icing and sprinkled with sliced almonds. It’s ridiculous! 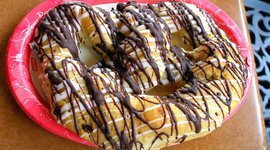 On chilly winter nights, order a nice cup of coffee along with this pretzel, and sit overlooking the water with someone you love. It’s one of those amazing, yet simple things in life that you won’t forget. If you love fried fish and shrimp, this is definitely the place to go. There are healthy options too, that are not only good for you, but delicious. You may crave the typical battered fish and fried shrimp, but try the Lighthouse Sandwich, which is hummus, tomato, and slaw on multigrain bread. They also have a lobster roll, two different types of meal-sized salads, and a tuna sandwich. But the star of the menu is definitely the grilled salmon. 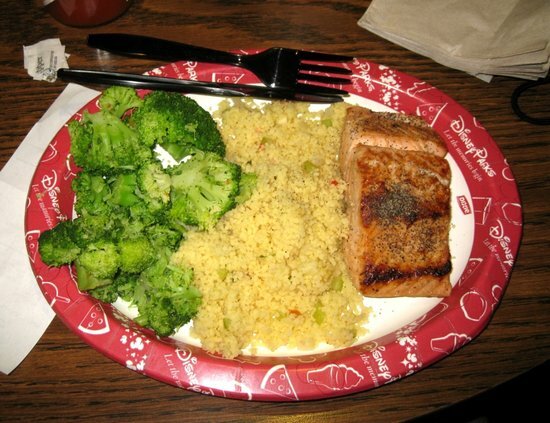 It’s served with couscous and steamed broccoli. Sprinkle it with tabasco for a little extra kick. This small stand in the Japan Pavilion serves small sushi rolls as snacks, but this is really the spot if you’re in need of a drink, and want to try something adventurous. They serve alcoholic beverages, including hot and cold sake, beers, and plum wine. And then there’s the Kakigori. 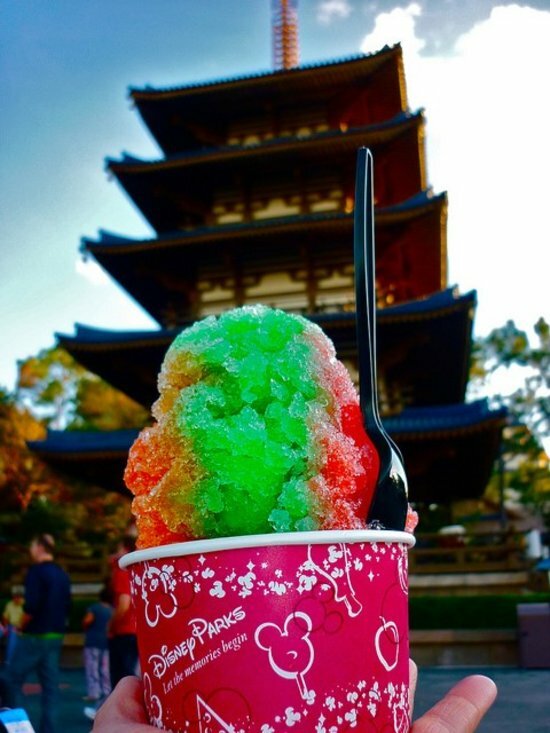 When the weather is hot and humid there’s nothing better than this Japanese shave ice concoction. It comes in several different flavors, but I recommend getting the rainbow flavor (a combination of all of them), and pay the extra $1.00 to top it with sweet milk. Trust me on this. 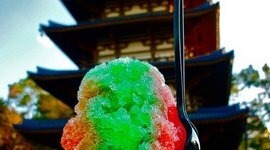 Find a nice, shady place to sit and enjoy your Kakigori, or take it on the go and notice the looks of envy from the people passing you by. 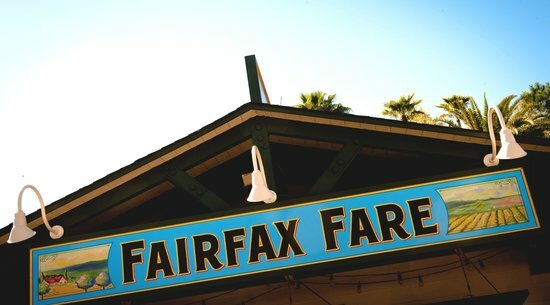 This isn’t your ordinary county-fair waffle and funnel cake joint. 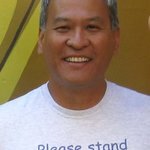 They serve both savory and sweet waffles. The ham, prosciutto, and cheese waffle sandwich shouldn’t work, but it does! You can also order their delicious fried chicken and waffles. 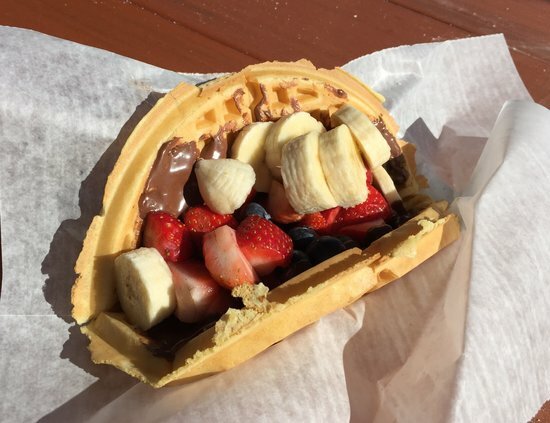 But, ah, the star of the show, the one that will make heads turn when you carry this back to your group as you walk through the crowds, is the Nutella Fresh Fruit Waffle sandwich. Imagine, if you will, a fresh, made-to-order waffle, shmeared with Nutella chocolate hazelnut spread, and then filled with fresh strawberries, blueberries and sliced bananas, all sprinkled with powdered sugar. How bad can that be? You may tell yourself that you’re getting your necessary servings of fresh fruit. Ladies and gentlemen, boys and girls, this one is not to be missed! 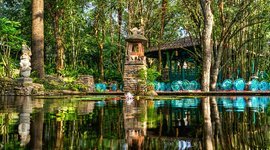 At the edge of the water, in front of the Mexico pavilion, this quick service restaurant offers barbacoa tacos, chicken, and the usual nachos and guacamole. For the adults, they serve margaritas, mojitos, and beer. 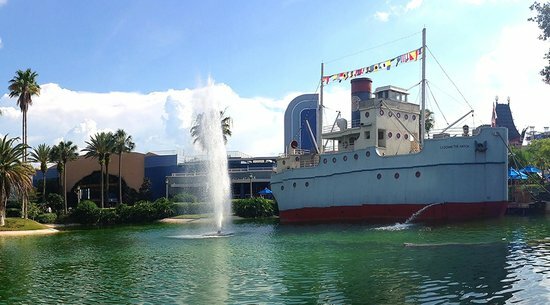 A main attraction here is that you can sit right by the lagoon in the shade. It can be quite a relaxing place for lunch or dinner. However, there’s also an indoor seating area, which is especially useful to know if the outdoor area is full, or the weather is awfully hot. Most guests often miss the entrance to the indoor seating area because the doors are usually not open. Look for large double doors just to the right of where you ordered your food. Try to snag a seat near the large glass windows and you can watch people boarding It's a Small World. This charming restaurant serves flatbreads, sandwiches, and salads. 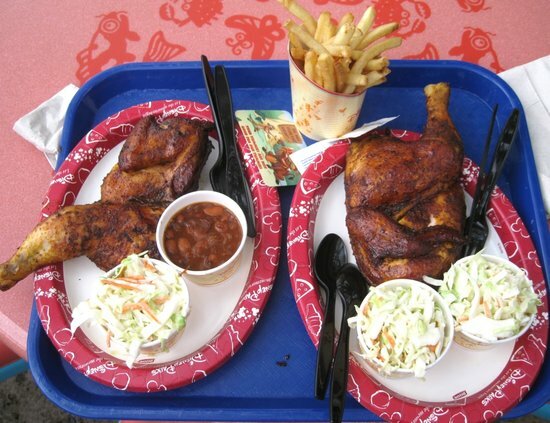 Along the water, this Animal Kingdom restaurant serves a delicious half-smoked chicken and St. Louis-style BBQ ribs. It's all about BBQ chicken and pork here. With indoor and outdoor seating, this Hollywood Studios restaurant is also a great spot to get giant turkey legs. You'd expect to find a bakery this good on the streets of Paris. Their open faced sandwiches and pesto chicken are also quite satisfying. Docked on the manmade Echo Lake, you're in the center of everything. They're known for their mac 'n cheese, pulled pork, and Buffalo chicken. Try the decadent fried fish sandwich and lobster roll, or the healthy grilled salmon with couscous and steamed broccoli. You might not think that the Ham, Prosciutto, and Cheese Waffle Sandwich would be good. But it is! 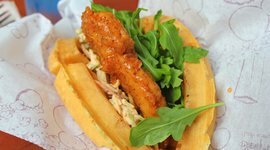 They also have classic chicken and waffles and plenty of sweet choices too.